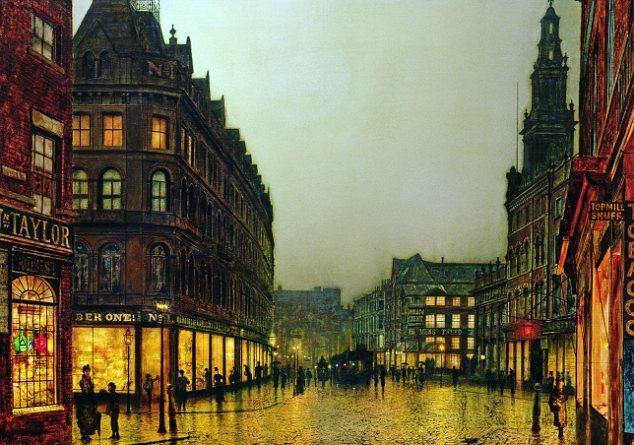 Grimshaw created night-scapes of amazingly accurate color and lighting. 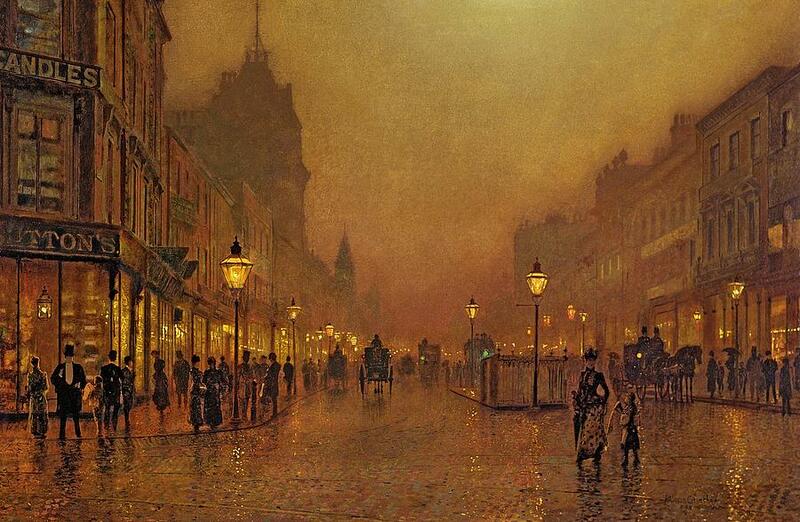 He gave his work such vivid detail and realism, that it’s been described as “sharply focused, almost photographic.” Grimshaw frequently depicted city street scenes and moonlit views of the docks in London and Glasgow; but he managed to capture only the charm, and none of the grit and grime of the Victorian Industrial Age. On Hampstead Hill is considered one of Grimshaw’s finest works, a night-scape that exemplifies his skill at capturing the mood of the passing of twilight into night. 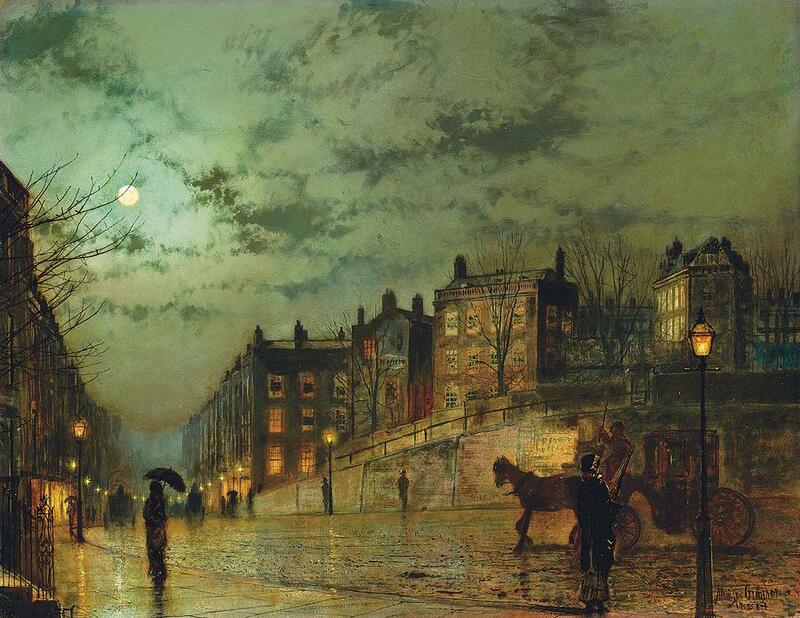 So adept was Grimshaw at painting lighting effects that he was able to capture both the mood and the minutest details of a scene. 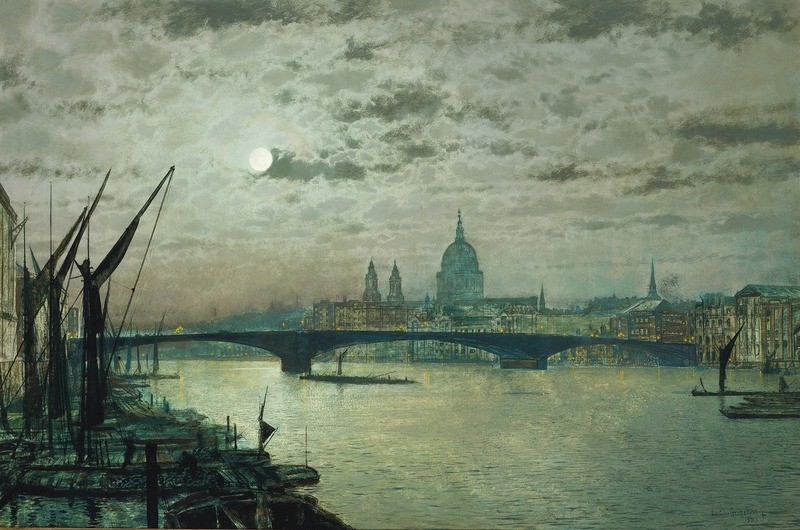 He could capture the seasons of the year, or the type of weather; and his “paintings of dampened gas-lit streets and misty waterfronts conveyed an eerie warmth….” His work was popular with London’s middle class, and it sold quickly and well. When you look at his vivid lighting effects, you may understand why we like to think of Grimshaw as the Thomas Kinkade of his day. Not much is known of Grimshaw’s life. 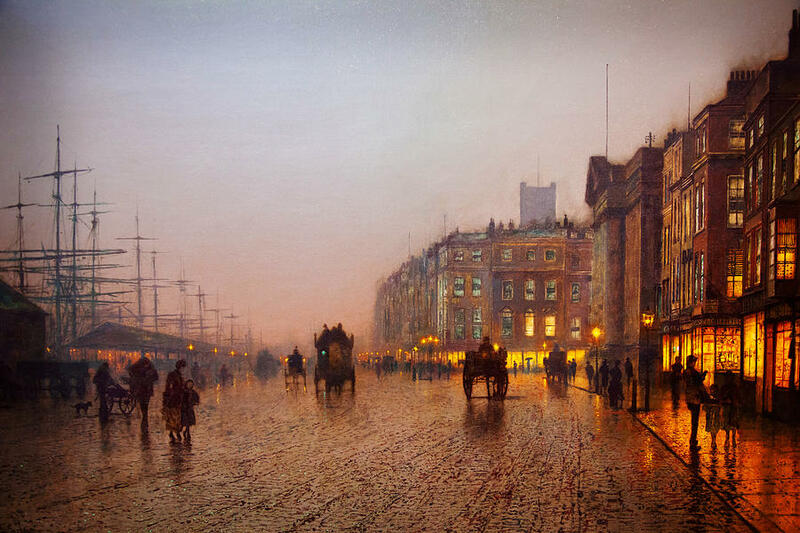 Unlike most painters of his time, Grimshaw did not leave behind any journals or letters. We do know that he was born September 6, 1836 in Leeds. In 1856 he married, and in 1861, at the age of 24, he shocked his parents with the news he was giving up a stable and well-paying job as a clerk for the Great Northern Railway, to become a painter. And he struggled for eight years, painting birds and fruit, before he developed his unique style and found success. 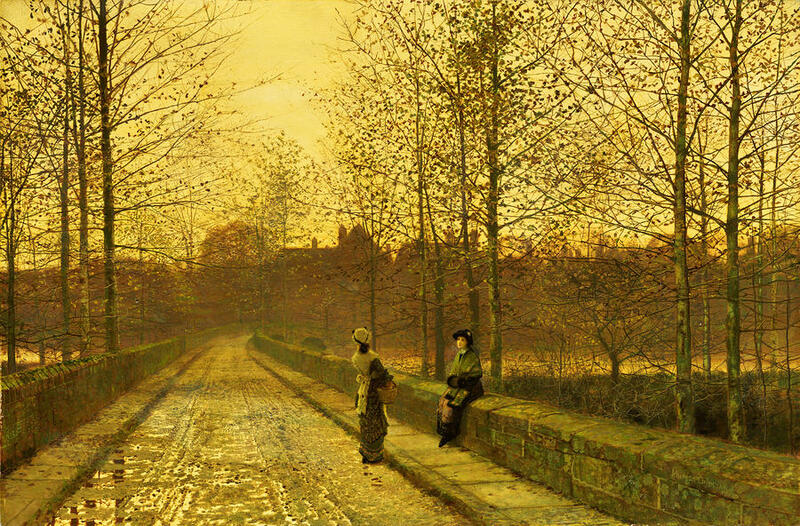 On the back of one of his canvases, Dulce Domum (1855), Grimshaw wrote, “mostly painted under great difficulties.” But John Atkinson Grimshaw wanted to pursue art, and he was willing to pay his dues. We present his lovely work today, to move you and inspire you. Whether you’re a novelist or a composer or an illustrator, it’s “visual music” to create by.